Introduction: Salt stress is one of the most important abiotic stress factors which severely affect agricultural production. Osmotins and OLPs (osmotin like proteins) are kinds of proteins which were produced during plant adapting to the environmental stress. Objective: These proteins were closely related to osmotic regulation and resistance stress. They are widely distributed in plants. Their expression for these genes was induced by salt stress, which played important roles in plants responding to salt stress. 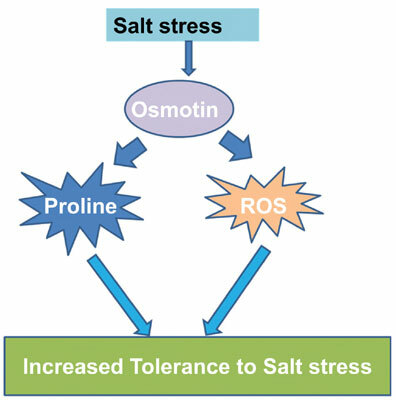 Conclusion: During salt stress, osmotin can help accumulate proline, and quench reactive oxygen species and free radicals. Keywords: Salt tolerance, Osmotin, OLPs, Abiotic stress, Proline, Reactive oxygen. Keywords:Salt tolerance, Osmotin, OLPs, Abiotic stress, Proline, Reactive oxygen. Abstract:Introduction: Salt stress is one of the most important abiotic stress factors which severely affect agricultural production. Osmotins and OLPs (osmotin like proteins) are kinds of proteins which were produced during plant adapting to the environmental stress.